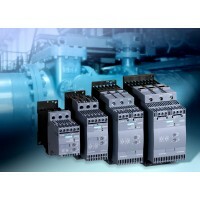 SIRIUS 3RW soft starters offer a seamless range that covers all standard and high-feature motor starting applications. They can be used in the widest range of applications to exploit the advantages of soft starting for the easy and efficient realization of optimum machine concepts. The compact two-phase-controlled 3RW30 facilitates efficient and space-saving soft starting up to 55 kW (with 400 V). The 3RW40 additionally offers soft stopping as well as integrated intrinsic device and motor protection functions, thanks to which an additional overload relay is unnecessary. Device versions up to a rating of 55 kW (with 400 V) are available: Thermistor motor protection evaluation, 400–600 V.